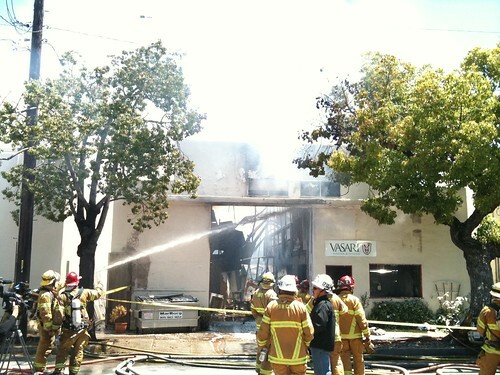 Vasari Plaster at 121 Santa Barbara St, burned down this morning around 10am today (Monday). 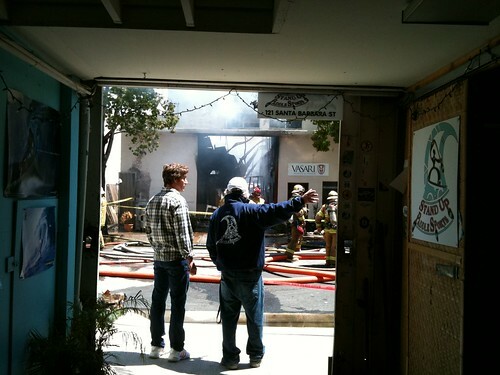 Owner Alex Conrad was said (by folks I talked to) to have escaped with minor burns. His dog, Spider also escaped with only light injuries. No one else was injured. The building, a 1930's WWII era quonset hut collapsed in under an hour. More photos and video to come soon. Here is some video of firefighters working on a persistent hot spot. 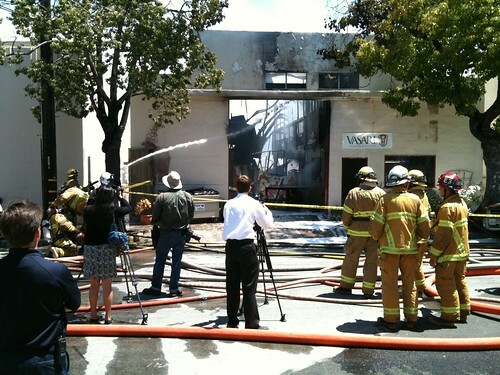 SANTA BARBARA, CA – 6/6/2011 – At approximately 10:33am Santa Barbara City Fire crews responded to a report of a working structure fire at 122 Santa Barbara Street. The first engine arrived on scene at approximately 10:36am and due to the amount of smoke and flame immediately requested a second and third alarm. The first in crew determined based on the type of construction of the approximately 3000 square foot commercial structure that fire personnel were going to need to attack the fire from a defensive mode. This means that they have determined the structure to be unsafe for entry by firefighters and the strategy will be to protect all surrounding structures and attempt to contain the fire to the building of origin. 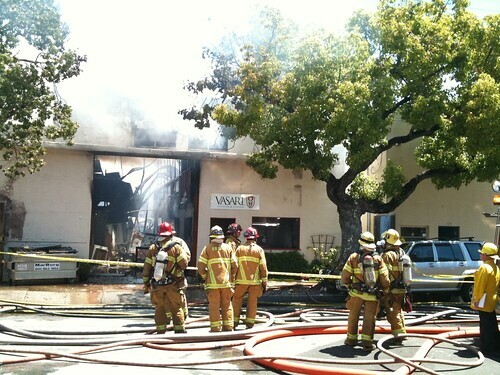 There was a partial collapse of the structure. Firefighters were successful in containing the fire to the building of origin and controlled the blaze at approximately 11:30am. A civilian adult male sustained burn injuries and was taken to the hospital. None of the injuries are considered life threatening. 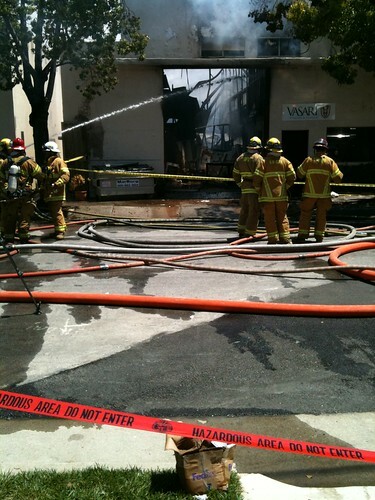 Additionally, one Santa Barbara City Firefighter sustained a back injury and was taken to get medical attention. There was also a dog that was rescued from the blaze. 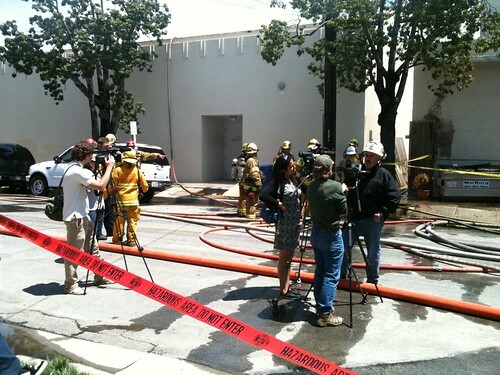 The total response to this incident included 6 Santa Barbara City engines, 1 Montecito engine, the Santa Barbara City Fire Ladder Truck, 4 Chief Officers, and the Santa Barbara City Fire Hazmat vehicle. I've heard the Conrad family has been taken in by some friends. 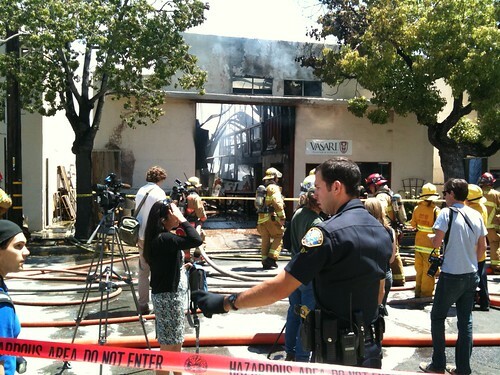 What a relief to hear injuries were minimum, but very sorry for this loss of business and building. that's insane. Good to hear no one was killed. good that the fire department was so on top of it. the surrounding buildings were totally saved. One of the firemen I spoke to said that, because of the corrugated steel roof, the firefighting quickly went from 'offensive' to 'defensive' (ie protecting the other buildings). It was fascinating to see such epic teamwork on the part of the first-responders, fire, police etc. Wow, great photos and reporting! Very professional, "Almost Native Son".